Our aim is archiving and making accessible Internet resources relevant for Chinese Studies, with special emphasis on social and political discourse as reflected by articulations on the Chinese Internet. DACHS exists since 2001 and was initiated by the Institute of Chinese Studies at the University of Heidelberg. The Sinological Institute at Leiden University joined the project in late 2003, which has resulted in this homepage. For more general information on DACHS and our collection policy, please visit the introduction page on DACHS Heidelberg, or read our publication in IIAS Newsletter #33 (March 2004). You can also view the presentation on DACHS at the XVth EACS Conference in Heidelberg (August 25-29, 2004). The collection of DACHS in Heidelberg includes websites, e-journals, films, snapshots of discussion boards, and single documents covering social and political subject matters. The archive currently contains about 625,000 files. Click here to go to the homepage of DACHS Heidelberg. The archive of DACHS Leiden will consist of topical projects, which are maintained by specialists in various fields. They help us to select websites that might be lost in the near future, write introductions to the archived contents and contribute publications on the topic in digital form. In addition to the projects, we also collect relevant E-publications and occasionally we archive websites on Topical Issues. Please use the side menu to navigate through our contents. Metadata search and full text search functions will be implemented in the near future. Please note that archived data on the DACHS site is protected and therefore not freely accessible. Access is automatically allowed from computers within the Leiden University or University of Heidelberg networks (through IP recognition), or upon password login. You can get a free password from the DACHS server administrators in Heidelberg by filling out an e-mail form. If you are doing research in a certain field of Chinese Studies and use online resources that should be preserved for future reference, you might be interested in becoming a Project Member of DACHS Leiden. Or perhaps you come across single discussions and publications on the Web that should be archived. In both cases, please don't hesitate to contact one of our staff members. If you have difficulties viewing the contents of this site, please refer to our help section. 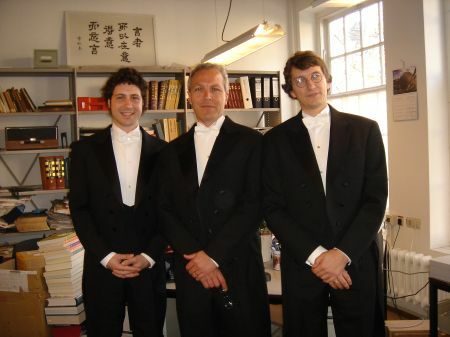 On 4 October 2005, Michael Day became Dr. Day upon succesfully defending his thesis China's Second World of Poetry: The Sichuan Avant-Garde, 1982-1992. Below is a picture taken on the day. Last update on website: 26 Dec 2007 (RVC).